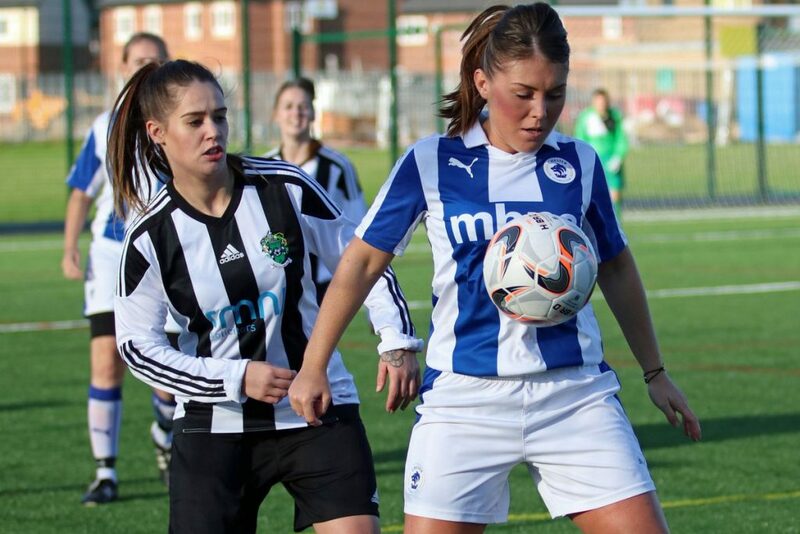 Double winners Chester FC Women have been promoted to the North West Women’s Regional Football League for the 2018/19 campaign. Last season the Blues were crowned Cheshire Women’s League Division One champions and lifted the Challenge Cup, and now make the step up next level of the women’s football pyramid. The team, which receives fantastic backing from the club’s principal partners MBNA, will line up in Division One South alongside the likes of Altrincham, Curzon Ashton, Northwich Vixens, Stockport County Blues and Warrington Wolverines. Promotion caps an outstanding 12 months for manager Dean Vian and his squad, who are looking forward to the challenge ahead. “We are delighted promotion has been confirmed and relishing being part of the North West Women’s Regional Football League,” said Vian. “What the team achieved last season was fantastic and I’m incredibly proud of the players for accomplishing the targets we agreed during pre-season. “We know that we will need to improve again but I am confident the squad will do so and sure we will give a really good account of ourselves. The club’s women’s football section is managed through Chester FC Community Trust and includes Chester FC Women and an Under 18s team competing in the Cheshire Women’s Youth League as well as a Girls Player Development Centre and Girls Football Centres. Jim Green, chief executive of Chester FC Community Trust, said: “This is great news and a well-deserved reward for last season’s efforts. “Dean, his management team and the squad have been wonderful representatives for our club and I know how much they are looking forward to next season. For more details about women’s and girls’ football at Chester FC, email community@chesterfc.com or contact the club on 01244 371376. 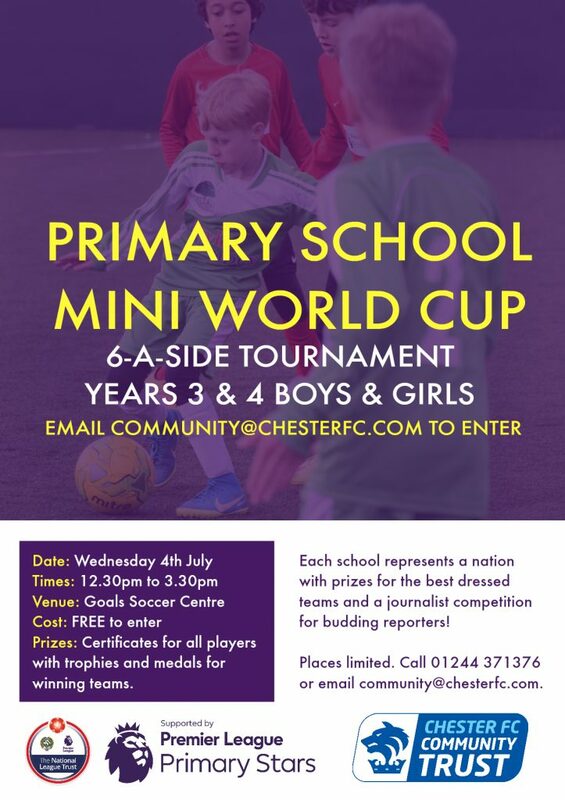 Chester FC Community Trust is hosting a World Cup-themed Premier League Primary Stars football tournament for local schools. The free event is open to primary schools across Chester and Ellesmere Port with competitions for boys and girls in Years 3 and 4. Each school taking part in the six-a-side tournament will be given a nation to represent with prizes for the best dressed teams, certificates for all players, trophies and medals for the winning teams, and a journalist competition for budding reporters too. The event is being hosted at Goals Soccer Centre on Wednesday 4th July between 12.30pm and 3.30pm. Entries are now open but spaces are limited and will be allocated on a first come, first served basis. There is a girls competition and a boys competition in which mixed teams can compete. Squads can have a maximum of eight players from Years 3 and 4. Chester FC Community Trust has received a national award for its work supporting men who have experienced mental health problems. The charity won the Best Health Project category in the 2018 National League Trust Community Awards, which celebrate the impact of clubs across the three divisions of the National League in their communities. 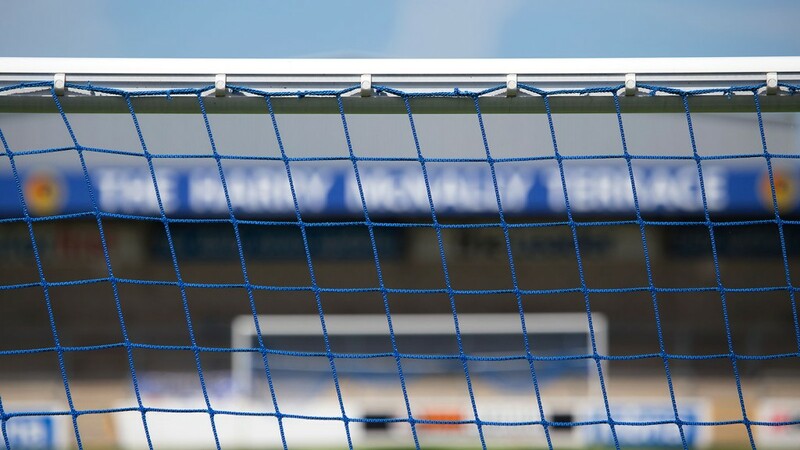 Chester FC Mental Health & Wellbeing is a partnership between Chester FC Community Trust, forfutures, which provides homeless support services across Cheshire West and Chester, and the Cheshire Centre for Independent Living through the Get Yourself Active project. Weekly football training sessions take place at the Northgate Arena and a team representing Chester FC competes in the Cheshire Ability Counts Football League with participants invited to attend Chester FC matches as a reward for their involvement in the project. The project helps to reduce the social isolation people with mental health problems can experience, offering participants opportunities to make friends and keep fit in a welcoming environment and talk about their problems without stigma, seek advice and access additional support. In addition to physical health benefits, evidence shows regular exercise is beneficial for mental health and well-being too, helping to reduce stress and anxiety, increase self-esteem and reduce risk of depression. 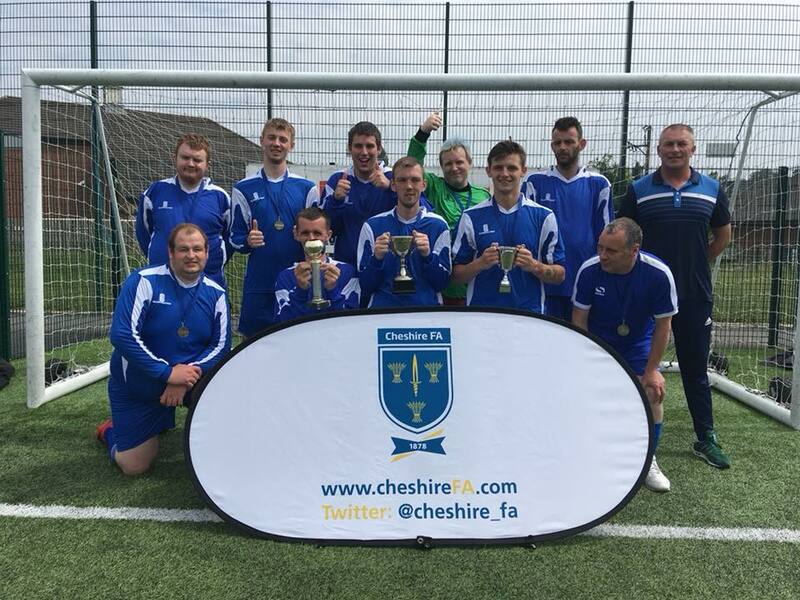 Lee Gregg, who lives in Blacon, is a regular at the sessions and has captained the team, who completed a Cheshire Ability Counts League and Cup double this season and won the Cheshire round of the FA People’s Cup. He said: “I first started going to the sessions about three or four months ago and I absolutely love it. “I’ve always wanted to play for Chester FC and now I’ve got that opportunity. It means a lot to me to be able to play for the club and they’ve been great in inviting us to matches. “My fitness has improved and I’ve lost quite a bit of weight since I started. I feel better in myself and I feel more confident. “I didn’t know any of the other lads when I went to my first session but they are a great bunch. We have a good laugh, I’ve met some new people and they’ve become good mates. Levi Lloyd, of forfutures, has been involved in the project from the outset and manages the team. He said: “I have seen first-hand the difference this project has made and how much pride the lads take in being associated with Chester FC. “From a group of individuals who didn’t know each other and who each has their own issues to face, the lads have become a real team and are now friends who support each other on the football pitch and in everyday life. Jim Green, chief executive of Chester FC Community Trust, said: “We are thrilled to receive this award and grateful to the National League Trust for their recognition and continued support of our programme. Thomas Bell, Get Yourself Active coordinator for Cheshire Centre for Independent Living, said: “This project has been a great success and highlights the importance of partnership working in order to create new, fulfilling activities for service users. Chester FC Community Trust is seeking enthusiastic and talented coaches to join our expanding team. We currently have a number of opportunities across our programme including for a goalkeeper coach with a minimum of an FA Level 2 in Coaching Goalkeepers qualification. As a Community Coach, your role will be to plan and deliver high-quality coaching sessions to a broad range of participants and support the development of new programmes targeting increased participation. 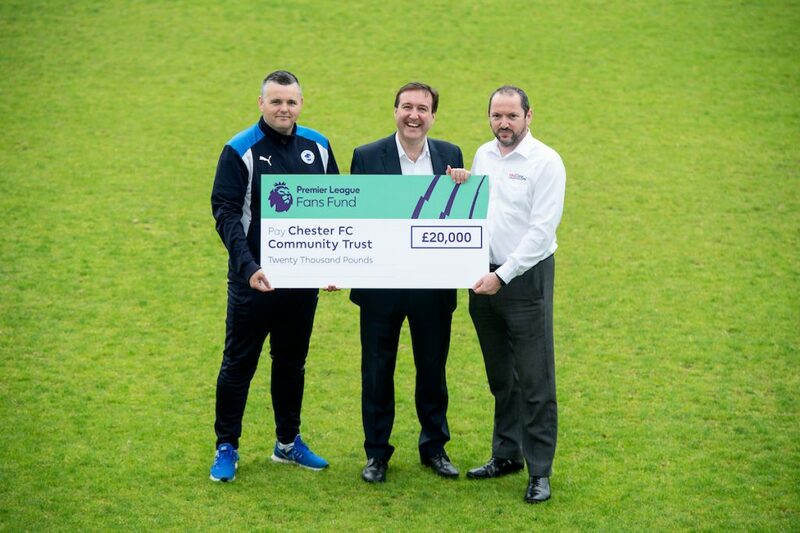 You will also be expected to maintain and develop excellent relationships between Chester FC and our partners in the community including schools and clubs. Applicants must have a minimum of an FA Level 2 qualification and will ideally be members of the FA Licensed Coaches’ Club. Experience of delivering in school or club environments is essential and a recognised coaching qualification in another sport would be an advantage. Please note due to the variable demands of the role, this is a casual post and will involve evening and weekend work. For further information please contact Chief Executive Jim Green via jim.green@chesterfc.com. 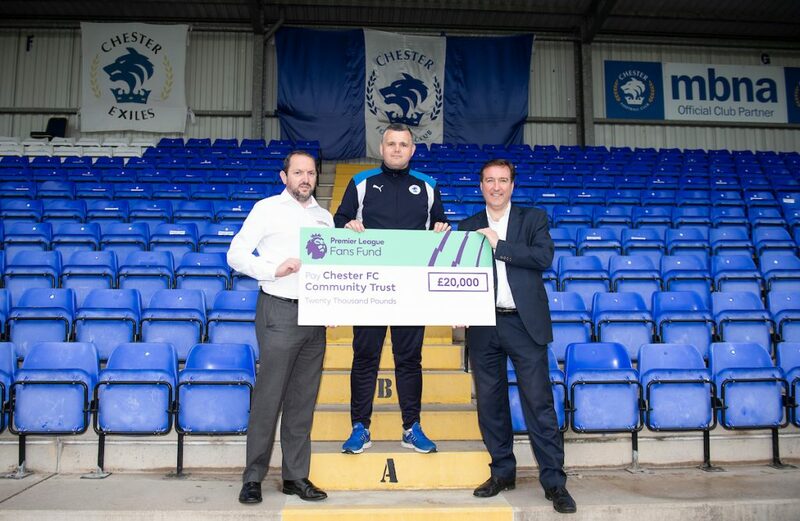 Chris Matheson, MP for the City of Chester, was on-hand to officially award the cheque for Chester FC Community Trust’s Premier League Fans Fund grant. Chester FC Community Trusts funding officially awarded by Chris Matheson MP.